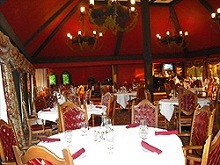 The Beach House on Deer Lake offers lunch and dinner daily during the summer months, just steps away from the Boyne Mountain Golf Shop and the sandy beach. Choose from indoor and outdoor patio seating with views of Deer Lake and spectacular sunsets. The menu features regional favorites such as walleye, perch and salmon along with grilled steaks, and also newly-added pasta entrees, Italian small plates and specialty pizzas. Enjoy a full bar and wine menu as well as housemade desserts.